A New Strategy Toward Cancer Control. Still in its infancy, the familial/hereditary approach to cancer control is proving to be one of the most potent strategies in the war on cancer. Over the past few years the human genome project has generated an abundance of valuable information on the genetic origins of a range of cancers. Tests now exist for several hereditary, tumor-promoting genetic mutations-including those found in BRCA genes associated with breast cancer as well as mutations of HNPCC genes which have been linked to colon cancers-and many more are anticipated in the near future. Armed with the information yielded by these tests, physicians have already saved countless lives through preventative counseling, early detection, and more highly-focused intervention strategies. * Information gathering and history taking. * Genetic testing for colorectal, endocrine, breast, and other familial cancers. * Diagnosis, prognosis, and management of an array of familial cancers. * Genetic counseling for familial cancers. Up-to-date, authoritative, and comprehensive, Familial Cancer and Prevention is an important working resource for clinicians, cancer researchers, and epidemiologists. 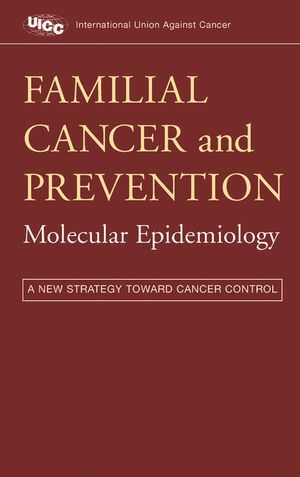 Joji Utsunomiya and John J. Mulvihill are the authors of Familial Cancer and Prevention: Molecular Epidemiology: A New Strategy Toward Cancer Control, published by Wiley. The UICC Familial Cancer and Prevention Project (W. Weber). Molecular Epidemiology of Human Cancer (S. Hussain & C. Harris). From Nurse to Nodal Points: The Rationale of a Questionnaire and Database to Collect, Validate, and Exchange Information on Familial Cancer (D. Brunetti & W. Weber). Collecting Information About Familial Cancer (W. Weber, et al.). Family History-Based Screening for Colorectal Cancer (D. St. John). Hereditary Tumor Registry in Korea (J.-G. Park). Ethical Issues in Precancer Screening: The Parallel With Huntington Disease (D. Dickenson). Bioethical Concerns With Rights of Patients Receiving Genetic Tests (K. Hoshino). Use of Genetic Information by Private Insurers (R. Pokorski). Surgical Management of Familial Adenomatous Polyposis (J. Utsunomiya & N. Gondo). Extracolonic Symptoms of Familial Adenomatous Polyposis and Their Association With a Slow Acetylation Phenotype (R. Scott, et al.). Defining the Clinical Phenotype of Hereditary Nonpolyposis Colorectal Cancer (N. Beck, et al.). Evolution of Neoplasia in Hereditary Nonpolyposis Colorectal Cancer (J. Jass). Surveillance and Management of Hereditary Nonployposis Colorectal Cancer (H. Vasen, et al.). Genetic Diagnosis and Management of Suspected Hereditary Nonpolyposis Colorectal Cancer (J.-G. Park, et al.). The Impact of Living With Hereditary Colorectal Disease (T. Berk). Familial Colorectal Cancer in India: The Tata Memorial Hospital Experience (K. Mohandas). Nationwide Survey and Analysis of the RET Proto-Oncogene in Inherited Medullary Thyroid Carcinoma in Japan (H. Takami). Management of Hereditary Medullary Thyroid Carcinoma (J. Moley & S. Wells). Mapping of Non-BRCA1/2 Breast Cancer Genes (Y. Shugart, et al.). Cancer Risk-Modifying Factors in BRCA1 or BRCA2 Mutation Carriers (T. Rebbeck). Hereditary Multiple Exostoses and Cancer Risk (D. Porter & A. Simpson). UICC Molecular Biology Workshop Report (R. Scott). Workshop Report 1 (C. Harris).